Tips Up or Tips Down? I just returned from the grocery shopping with my five-year-old son. 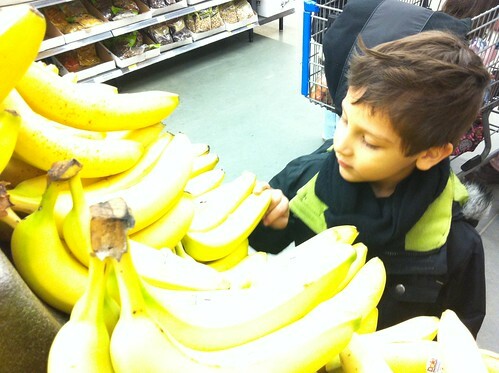 As we approached the fruit section, my curious little guy asked, “Do bananas grow with tips up or with tips down?” Since we don’t have a lot of banana plants in Regina, I didn’t actually know off-hand. But, being the connected father I am, I pulled out my iPhone, Googled it, and in less than 30 seconds, we were looking at photos of banana plants and we no longer had to wonder. We no longer had to wonder. I did that entirely wrong. At the very least, I could have asked my boy, “Well, which do you think son?” perhaps followed by “So, why do you think that?” But I didn’t. And because I didn’t, I messed up a great learning opportunity. Instead of providing my boy with an extended opportunity to be curious, to imagine deeply and to think creatively, I reinforced one of the worst habits of our generation. I demonstrated to my boy that you can solve a problem without thinking. And, I won’t do that again. One of the videos I showed last night during my Media Literacy presentation was the recent “David After Dentist” video. The scene is of a seven year old boy who just left the Dentist’s office and was still feeling the effects of sedation. I’ve posted the video to Twitter, and while most people report it to be quite funny, others were more critical of this scene being posted to Youtube for all to see. The original video (posted below) was posted January 30, 2009, and has already been viewed over 7 million times. How does this relate to media literacy? During his state of sedation, the boy asks “is this forever?” While the dad reassures him that it isn’t, in the (digital) media sense, it is forever. Whether the boy likes it or not, he is now an Internet star. The scene will likely follow him into classrooms, into careers, into relationships; it will forever be part of his identity. Whether he accepts his fame as mostly positive (see Gary Brolsma) or especially negative (see Ghyslain Raza) is yet to be seen. What is certain is that the distribution of this video, a piece of David’s identity, is no longer in anyone’s full control. Are kids influenced by popular culture? I wonder if all of the adults in this case knew where the phrase “that’s what she said” recently came from. Anyone remember it here? Discover Magazine recently interviewed Danah Boyd, a well known PhD candidate who has been studying social networks. The interview is described as “a look at how kids use technology, where mobile phones are going, and the Facebook vs. Myspace smackdown.” Click the photo to watch the interview. For many, there will not be much new information on social networks here. However, for those who have missed the piece on the beginnings of formalized social network services and how kids are connecting online, there are some interesting points made here. This series of kid-created videos detail methods for cheating in school (via LawGeek). I have a feeling that videos related to the theme “how to be a good student” or “study skills” are not nearly as popular on Youtube. I have been enjoying many of the recent and not-so-recent stories related to youth, their perceptions of educational technology and their often amazing skill sets. 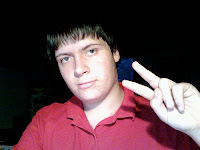 Hargadon feels that while “Artus is not representative of most 14-year-olds, he is representative of the kind of independent, engaged, proactive, and self-directed learner we often think will thrive in the flattened and connected world of the Internet.” I agree. Don’t miss this interview. I’ve also recently heard about Andrew Sutherland, the creator of Quizlet and president of Brainflare. Quizlet is described as a “lightning fast way to memorize vocabularly lists. It is flashcards, but much more fun and interactive.” Quizlets can be easily and intuitively created, combined, shared, searched and used in several ways. Sutherland was only 15 years-old when he developed Quizlet. It’s a neat site and I’m finding many of my university students are using it (although I wish they weren’t subject to courses where memorization was that important). It is becoming clear that our youth our becoming more technologically savvy. In some cases, these teens end with long careers in IT. The individuals mentioned above have already started on this path. Yet, I noticed an interesting article from Computer World yesterday that paints a different picture. The article suggests that while many of our youth are comfortable with technology, this very factor can deter these students from entering high-tech careers. This is the group that simultaneously IMs, blogs, surfs the Web and downloads podcasts. In the end, ironically, it might be this extreme comfort with technology that most deters these young people from pursuing IT as a favorable, even desirable, career. “To another generation, IT was cool because no one else knew much about it,” notes Kate Kaiser, associate professor of IT (and one of Lee’s instructors) at Marquette. “This generation is so familiar with technology, they see it as an expected part of life” — and therefore not worthy of consideration as a full-time career. And the up-and-coming generation puts a premium on work/life balance, having seen firsthand the toll working around-the-clock took on its parents. As a result, they tend to shy away from jobs that demand the 40-hour-plus workweeks typical of IT. At the very least, it’s going to be interesting to see this generation grow up. And I hope everyday that teachers in the field will start to realize that we are dealing with an incredibly different situation in our schools. It is time we tapped into these precious talents and begin to see that the future of these kids will be radically different than anything we can predict.